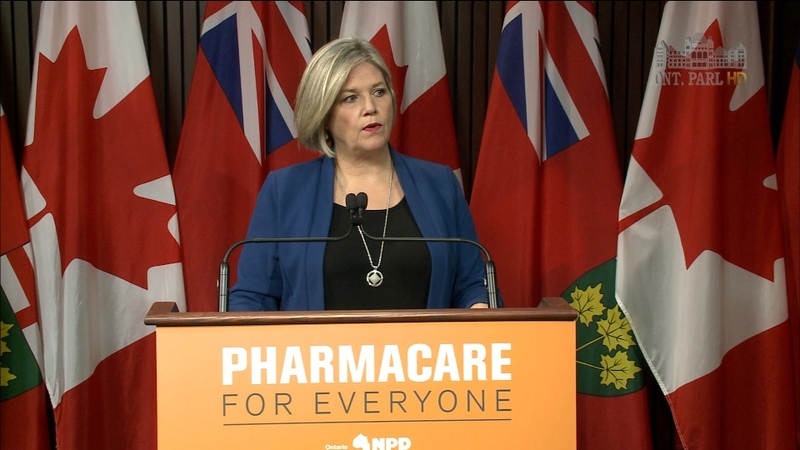 TORONTO -- Ontario's New Democrats are promising to bring in a $475-million pharmacare plan if they win the election next year, which they say could be introduced without program cuts or new taxes -- although they're not ruling them out. They say the plan would cover 125 medications deemed essential, including those for high blood pressure, asthma, diabetes, allergies, migraines, mental health conditions and HIV, as well as birth control. NDP Leader Andrea Horwath said more than two million Ontarians currently have no drug coverage. "I don't believe anybody in Ontario, or anybody in Canada, frankly, should be in a position where they can't afford to get the prescriptions filled that they need," she said. Ontario currently has six public drug programs and the NDP's vision of pharmacare would complement existing coverage. Pharmacare would come with no deductible, but will incorporate a copay tied to income, at a maximum of $6.11. The government would be able to secure "significant" savings when bargaining with drug companies on behalf of 14 million Ontarians, Horwath said. Private payers such as employers would save between $835 million and $1.9 billion as they would no longer have to cover those 125 medicines, the NDP said. In addition, the government would save money on its own employee health plans and would see lower health-system costs when more people are able to take the medications they are prescribed, Horwath said. Ontario will likely see enough economic growth in the coming years to fund the plan, Horwath said, but if not, they would look to shifting money from non-health programs. If neither of those two options come to pass, the NDP would introduce a new "revenue source," but when asked if that meant a tax, Horwath said the source would be one that wouldn't add a new burden to people or businesses. Progressive Conservative Leader Patrick Brown supported the intent of the plan, but was skeptical about the cost. "Just for once I'd like the NDP to say how they're going to pay for something," he said. "They're very good at making promises that they don't have to be accountable for." 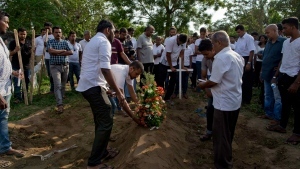 The cost estimates are based on a paper by University of British Columbia professor Steve Morgan, who said the $475 million is actually at the high end of his projections. "(That is) based on worst-case scenario assumptions about the ability of the program to secure price savings on medicines that it covers," he said. There are more than 1,300 different types of pharmaceuticals sold in Canada, and covering all drugs would be a big place to start, Morgan said. "However, establishing a universal public drug program...that covered a limited number of truly essential medicines and adding that on top of the existing structure of public drug programs for a province like Ontario is a truly practical way to begin to develop a universal pharmacare program that was more comprehensive," he said. The Ontario program would be fully implemented by 2020, the NDP said, but eventually expanded to include more medications, and ideally other provinces would get on board. Health Minister Eric Hoskins said he prefers a national pharmacare solution and has been strongly pushing for one for several years. "I think we've accomplished more nationally in the last three years than in the last 20 years before that," he said. "I don't think there is -- on the political side -- an individual that has worked as hard as I have to try to realize that dream." 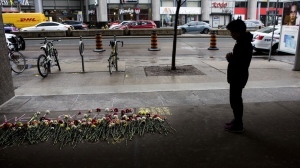 The Ontario Health Coalition said it would want to see all needed drugs covered, and not just 125, but that the plan would improve the current "patchwork" of private insurance plans and government programs. NDP leader Andrea Horwath speaks to reporters at a press conference on April 24, 2017.